Wonder Woman has always had a special place in my heart. As a wee one playing hopscotch, I would always make a special point of "Wonder Womaning" the turn at the top of the grid by imbuing it with as much drama as possible. Linda Carter's saggy baggy blue knickers were, to me, the very pinnacle of Glamma. A few years, ago, The Man gave me a pristine edition of a Wonder Woman comic for my birthday, which I was going to keep in its plastic shrink wrap until he insisted I open it. Tucked inside the cover was a voucher for a sky dive. Have I ever mentioned I'm afraid of heights? Calliope, who apparently specialises in 'character' belly dance, gets extra Brownie points if she took her name from the first volume of Neil Gaiman's Sandman series rather than from the Greek muse herself. Calliope makes up for that oversight with her improv in this number. OF COURSE there has to be spinning! I have enjoyed reading your posts for some time now, but this gem reminded me that I should show my appreciation with a comment. 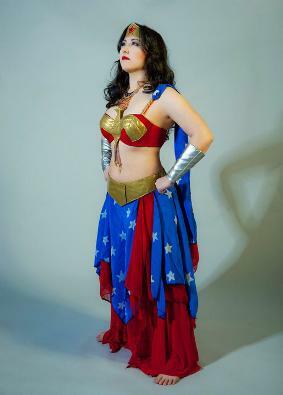 As a creator of the occasional odd costume (and as a DIE HARD Wonder Woman fan), thank you, and please keep posting! Thank you very much, Anala. And if you ever want to share pictures of your "odd" costumes I am all eyes! Thanks so much for your kind review. I'm glad you liked the costume and performance. P.S. Sorry, my website is temporarily down. I hope to have it back up in the next month. You are the amazingest! Thanks for stopping by, and for not minding that I'd posted about you! (Sometimes I wonder if it's welcome, you know.) I am loving that you are steam-powered organ and a tank-mounted rocket launcher. We are not worthy.